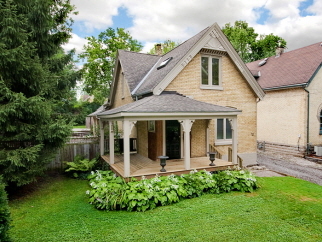 Rarely do you find a charming updated turn of the century home with features like this. An oversize lot and two car garage so close to downtown and finished so you can immediately settle in. Nestled in the Riverforks Community with just a five minute walk across the historic peace bridge and through Ivey Park to the bistros on King Street and concerts at the JLC this is a special place to call home, 2.5 large bedrooms, a 2nd floor bathroom with soaker tub and walk in shower all updated with the latest finishes. Large main floor family room and living room both with fireplaces, gas heat, central air and wood floors throughout, the backyard can only be described as your own downtown park with a new deck and brick patio to entertain and enjoy.